1866 May 6th. Born in Inverness, MacDonald was educated at Farraline Park Institution, Inverness. A consulting civil engineer by profession, he became President of the Institution of Civil Engineers in 1932. MacDonald was elected as a Liberal Party Member of Parliament (MP) for Inverness in 1922. He joined the National Liberal Party split in 1931, but resigned from the National Liberal group in the House of Commons in 1942 and according to some descriptions stood as an Independent Liberal MP at the 1945 general election. However Who was Who, The Times and Whitaker's Almanack all show Macdonald with the description Liberal National in 1945. At his last election, he became the House's oldest MP. He remained a member of his constituency association, which was aligned with the National Liberals. He sat until he retired in 1950, aged 83. WE record with regret the death of Sir Murdoch MacDonald, which occurred at his home at Nairn, Inverness, on April 24. Sir Murdoch, who was approaching his ninety-first birthday, had spent a distinguished career in civil engineering, which extended well over sixty years. In fact, it could not be said that he had retired, for until comparatively recently he had taken an active part in the design of a new bridge over the Ness in his native town of Inverness. Sir Murdoch, who was the son of Mr. Roderick MacDonald, received his general education at Farraline Park School, Inverness. His apprenticeship as an engineer was served with the former Highland Railway Company, and after its completion he spent some years as an assistant engineer on various railway construction projects in Northern Scotland. Among them, there was the building of the Black Isle line between 1890 and 1894, and the widening of the main line between Dalnaspidal and Blair Athol. Many years afterwards, Sir Murdoch recalled that this railway work in the early part of his career included the design and erection of an earthen dam, about 35ft high at its maximum point, across a small stream as well as the design of a small power station driven from it. In 1898, Sir Benjamin Baker invited Sir Murdoch to go to Egypt to act as assistant engineer to Sir Maurice Fitzmaurice, who was then engaged on the construction of the first Aswan Dam. Four years previously, a technical commission, on which Sir Benjamin Baker served, had been appointed by the Egyptian Government to examine different projects for the storage of Nile water. The commission reported in favour of the construction of the Aswan Dam, and selected an alignment which, it decided, should be straight from bank to bank. At the time, it may be recalled, there was a good deal of controversy as to the probable effect of the water issuing from the sluices on the rock downstream. Sir Murdoch's appointment as an assistant engineer for the building of the dam marked the beginning of a term of service in Egypt which continued for twenty-three years. When the first heightening of the Aswan Dam was undertaken between 1908 and 1912, he was director-general of irrigation for the Egyptian Government. Subsequently he became Under Secretary of State for Public Works, and finally adviser to the Minister of Public Works. For most of those years in Egypt, Sir Murdoch's principal work was, of course, concerned with the Aswan Dam. The original dam was completed in 1902, and provided water-storage capacity, additional to the normal river supply, for the requirements of Egyptian agriculture as it stood. Furthermore, the reservoir was capable of holding a summer water supply for such land as might reasonably be expected to be converted to summer irrigation in the immediate future. But by 1905 it appeared that Egypt was experiencing a cycle of low years in regard to the volume of water passing down the river during the summer. The Government was thus very soon faced with the problem of finding additional storage room to meet possible demands for the existing area, as well as making adequate provision for future extension. A scheme for thickening and heightening the existing Aswan Dam was prepared by Sir Benjamin Baker, and a great deal of the work involved was undertaken by Sir Murdoch. The project was brought to fulfilment principally under his direction, and the "first heightening" was completed in 1912. There were, however, several other projects initiated by Sir Murdoch during his years of service with the Egyptian Government. He was responsible for the planning and completion of overall drainage schemes for lower Egypt which finally dealt with about 3,000,000 acres. He also designed the Sennar Dam on the Blue Nile, and put into operation the first stages of the Gezira irrigation schemes for the conversion of virgin land in the Sudan for cotton growing. In addition, Sir Murdoch designed the Gebel Aulia Dam, which, though built in the Sudan, provides 4000 million cubic metres of water annually for irrigation in Egypt. Then he designed and constructed the head works of the Menufia Canal, the Esna Barrage - one of the largest works on the Main Nile - and effected large-scale improvements to Alexandria Harbour. But forty years or so ago, the propagation of many of these schemes for the development of Egypt aroused much controversy. One expert commission after another was set up to examine the projects and investigate the criticisms of them, and it was in this connection that Sir Murdoch prepared a detailed report entitled Nile Control. To this day it is looked upon as a valuable guide to the effective use of the waters of the Nile. Sir Murdoch retired from the Egyptian Government service in 1921 and on returning to this country established the firm of consulting engineers which practises under the name of Sir M. MacDonald and Partners. But he did not relinquish his work on Egyptian irrigation schemes. The firm was invited to submit proposals for a second heightening of the Aswan Dam, and the work was carried out between 1929 and 1933. On its completion, Sir Murdoch received a message of congratulation from the Egyptian Government. At about the same time, Sir Murdoch was responsible for work undertaken to strengthen the Esna Barrage, and he also advised on various schemes for land drainage and irrigation in Greece and Portugal. At the end of the second world war he was again consulted by the Government of Egypt about the Aswan Dam, and submitted a report advising that a third heightening was practicable. Between 1951 and 1953, Sir Murdoch was engaged on the design of four new schemes, for the Egyptian Government, involving barrages and storage reservoirs on the Nile. Twice during that period, undeterred by advancing years, he visited Egypt to discuss these works. In recent years Sir Murdoch's principal work in this country was associated with some of the North of Scotland Hydro-Electric Board's schemes, and with the Great Ouse flood protection scheme. This latter work was first considered early in 1938 following serious flooding in the Fens. Several proposals were put forward, and Sir Murdoch was asked to formulate a protection scheme in conjunction with the River Great Ouse Catchment Board. Detailed surveys were made to determine the practicability of the works involved, and a report dealing with the whole problem was presented to the Board. This report was printed in THE ENGINEER of March 7 and 14, 1941. It was impossible, of course, on account of the war, for the scheme to be proceeded with immediately, but further serious flooding emphasised the urgency. About three years ago the work was started in earnest under the direction of Sir Murdoch's firm, and when completed will effect tremendous improvement in the drainage of the Great Ouse basin. The works which we have touched upon briefly here indicate the foremost of Sir Murdoch MacDonald's activities during his long career as a civil engineer. But any record of that career would be incomplete without a reference to his services in other spheres. Sir Murdoch was elected an associate member of the Institution of Civil Engineers in 1892, and a full member in 1909. He became president of the Institution in 1932, and in his presidential address, delivered in November of that year, presented a most informative survey of the irrigation and other work with which he was so intimately associated in Egypt. Prior to that, he had presented to the Institution two papers dealing with various aspects of the work on the Aswan Dam, and for each of them he was a warded a Telford gold medal. 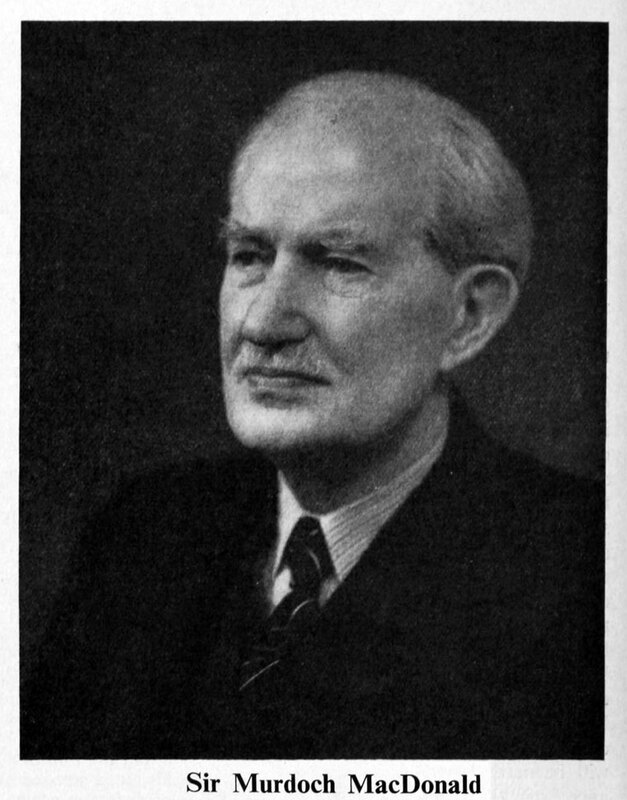 Sir Murdoch also gave much attention to political matters, serving as Member of Parliament for Inverness from 1922 to 1950. He was created K.C.M.G. in 1914, was awarded the honour of C.B. in 1917, and in 1930 received the Freedom of the Royal Burgh of Inverness. This page was last edited on 24 January 2018, at 12:13.